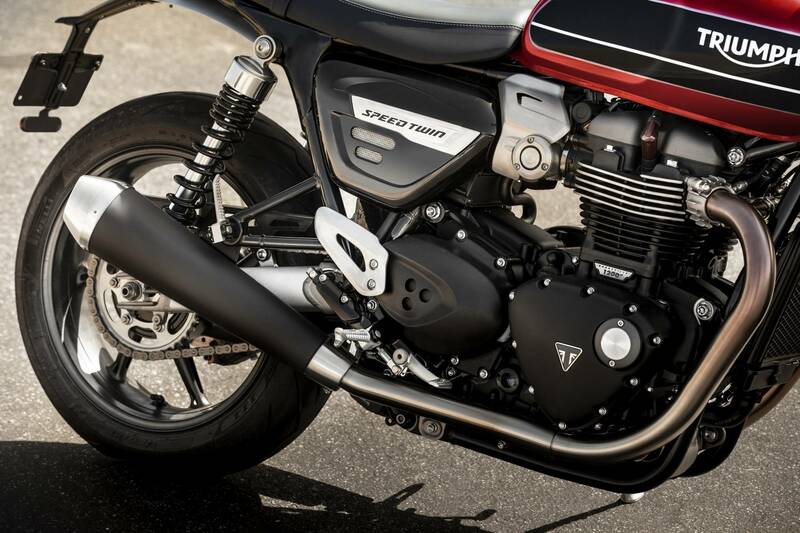 Triumph’s Speed Twin: not to be confused with the Street Twin, in much the same way the Speed Triple shouldn’t be confused with the Street Twin. So what’s the difference? Well, the Speed Twin is essentially what you get if you take a Street Twin and send it off to the gym for a month. 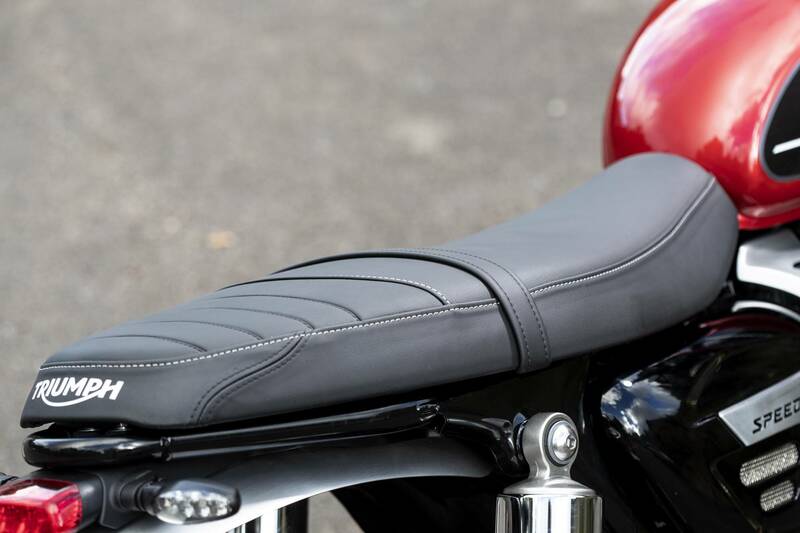 Or, perhaps, what you get if you rip the clip-ons off a Thruxton and replace them with handlebars. But it isn’t just a Thruxton for the weak and cowardly. It’s more powerful, more torquey, more muscular looking, more expensive and just that little bit more premium than the Street Twin. Exactly like the Speed Triple is to the Street, actually. But enough about the Triples. 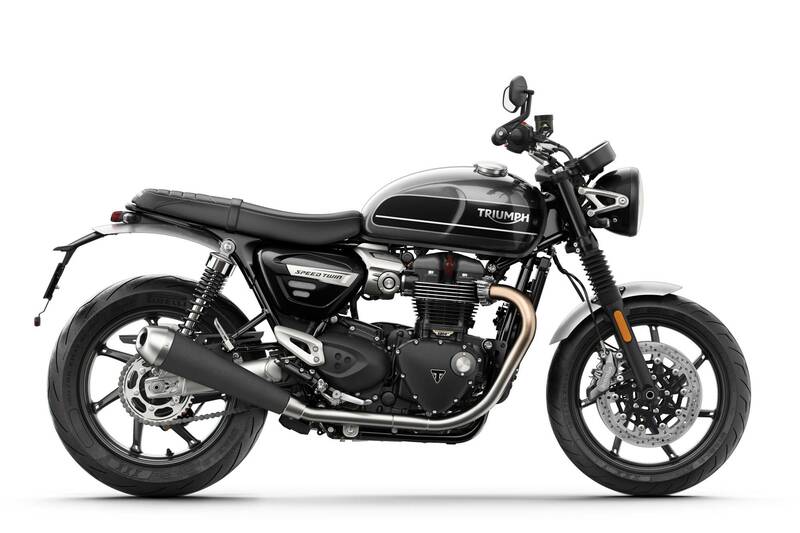 This one’s a twin, and it uses the exact same engine as found in the Thruxton, Scrambler 1200, Bonneville T120, Bobber, etc, but that’s only true to a point. It’s the 1200cc liquid and air-cooled parallel twin that we’ve all come to know and love, and it’s loaded with the same “tune” as the Thruxton, but the insides are quite different. The clutch is lighter, the crank is too, and the cam cover and engine cases are magnesium. And that, in theory, makes for a much more lively motor. 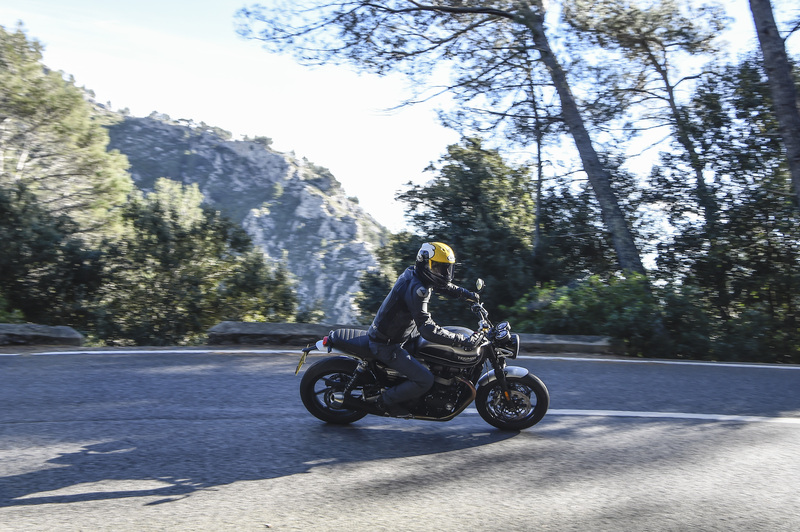 We’d sort of experienced this on the Scrambler 1200 launch – as the same modifications were done to the 1200cc lump there too – but that uses a different tune, and only has one throttle body, where as the Speed Twin has two. Max power output is 96 HP at 6,750 RPM and max torque is 112 NM at 4,950 RPM. The weight saving didn’t stop at the engine, though. Check out the holes in the spokes on the (admittedly rather gorgeous) 7-spoke rims. Those aren’t just aesthetic, they help drop nearly 3KG off the weight of the front-end as compared with the Thruxton. Weight has been lost from the back end too, and together with the engine mods, the entire bike’s a full 10 KG lighter than the Thrux; bringing the claimed weight to 196 KG. Impressive stuff. To be around, it’s a nice bike. Everything’s built and packaged really nicely. The front brake master cylinder matches the front 4-pot, 4-pad Brembos. The paint is rich and deep, and the coachlines are hand painted. The bar end mirrors are standard, the mudguards are actually made of brushed aluminium, the seat’s thin (yet comfy) and looks great, and someone at Hinckley has clearly spent far, far too much time pouring their soul into the design of the analogue dashboard clocks. The black on the stock exhausts is a bit “meh”, though, and so is the chrome on the rear shock units (preload adjustable only) which, on a bike which has more brushed alu than you can shake a stick at, doesn’t match anything else. The conventional forks are completely unadjustable, and the kick-stand has the smallest tang we’ve ever seen. But, kick-stand aside, there’s little to moan about, and when you sit and think about it, it sets up a future “R” model up nicely: Ohlins suspension front and back, radial brakes, 6-axis IMU action and even moar power. 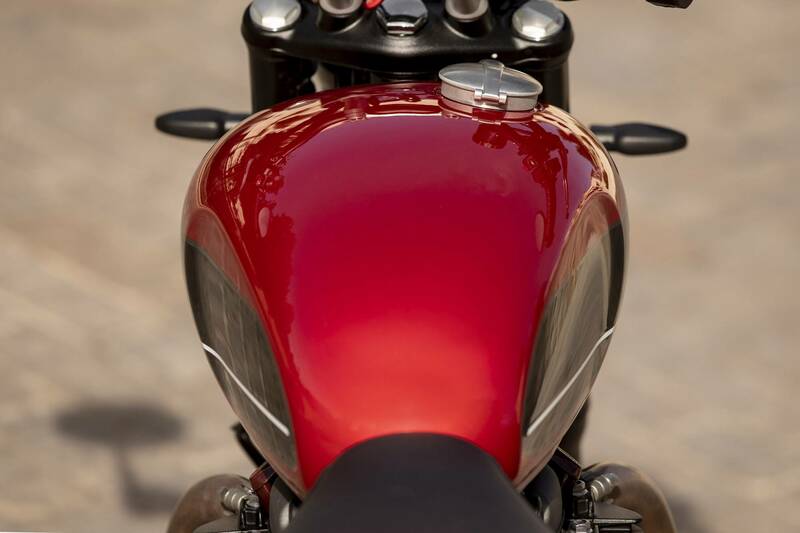 On the face of it, Triumph seemed to have achieved what they’d set out to: make a faster, more aggressive looking version of the little Street Twin. But as always, you’ve gotta get out and ride the thing to really get a verdict on things. 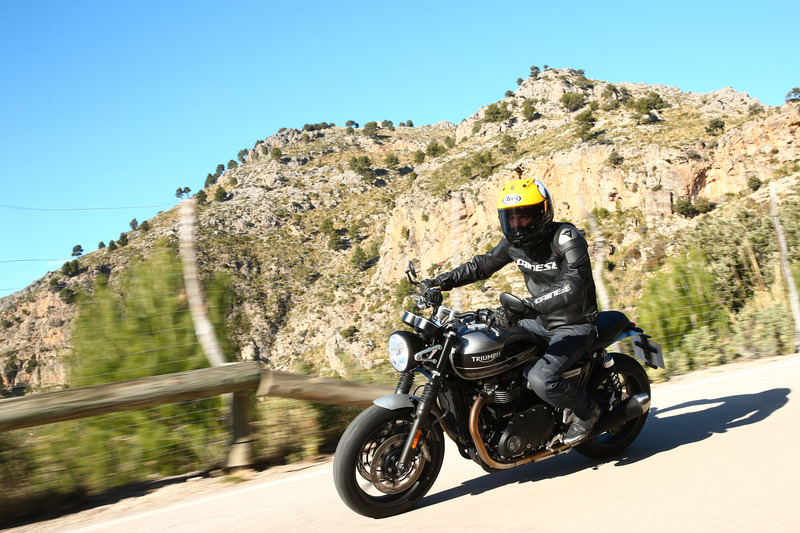 Triumph know how to launch a bike, and the roads of Mallorca was the destination to explore Speed Twin on ~120 miles worth of insanely twisty, flowing roads. Jumping on the bike it’s a familiar experience if you’ve sat on any Bonneville-based bike in the last few years. Mode/info buttons on the left handlebar, and everything else where you’d expect it to be. The usual Road and Rain mode has a companion that the Street Twin doesn’t: Sport mode. The 1200cc motor thumbs into life and we’re off. There’s a few miles of boring A-road equivalents to get out of the way first, but that gives opportunity to figure out that the engine’s keen, the gearbox is slick, wind protection’s about as good as you might imagine it to be (for a naked bike) and the brakes have plenty of feel and power, even if they aren’t radially mounted due to the conventional forks. Which just shows you, a lot of that “radial is better” stuff is mostly in your mind. Pete “Pesky” Ward’s leading the group, and it doesn’t take long before we take a right and leave the big roads behind. 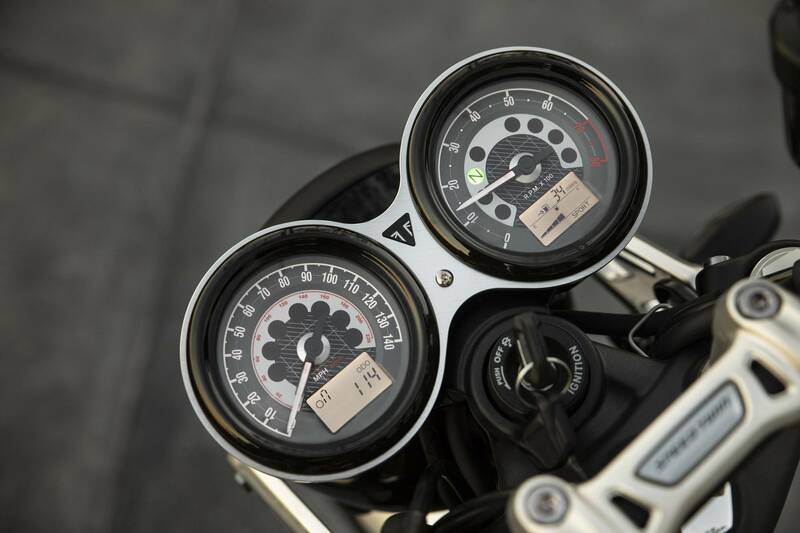 The pace is hotting up, and a few more of the Speed Twin’s facets come to light. The suspension’s just fine for fast road work, and the bike’s quite clearly set up for this kind of riding. It isn’t a big softy: it’s firmly sprung, allowing you to load the front up as you dive into corners. The bike feels light, and you can flick it from ear to ear with ease, but the weight comes back to the fore when you’re heavily on the brakes… which is par for the course with Pete (or in fact any of the lead riders Triumph use these days). The gearbox is a complete peach; you don’t really need to use the clutch, no matter whether you’re changing up or down. On the way up, load the lever, give the throttle a slight bit of respite and she’ll click another cog into place nicely, and it’s the same story but in reverse to change down. Nice. However, a quickshifter really would seal the deal. The thing you really discover though is just how good the engine is. It wants to rev and rev and rev, and a lump with this much displacement really ought not to feel so happy to spin up. That’ll be all that inertia that Triumph removed, and it makes it such a rewarding ride, especially in sport mode which has that extra bit of urgency over Road. There’s power everywhere, no matter what gear you’re in, and it belts out a cracking tune too. You can short shift, or you can hang onto gears – I preferred the latter, it seemed to be happier that way. It’s stable and sure footed into, through and out of corners, and the harder you ride it, the better it all feels on the Pirelli Diablo Rosso III rubber. Does it pass the “ride it like a complete bellend” test? Yep. Some other moto-hacks on the test complained about the rear suspension, but I had no issues. What I did have issues with, however, was the fuelling. Stop-start work was a bit of a chore, requiring some clutch-feathering around tight roundabouts, hairpin corners and town junctions. Presumably, that’s the trade off against such a large and lively motor: you can’t have it both ways, but it’s a shame none the less. 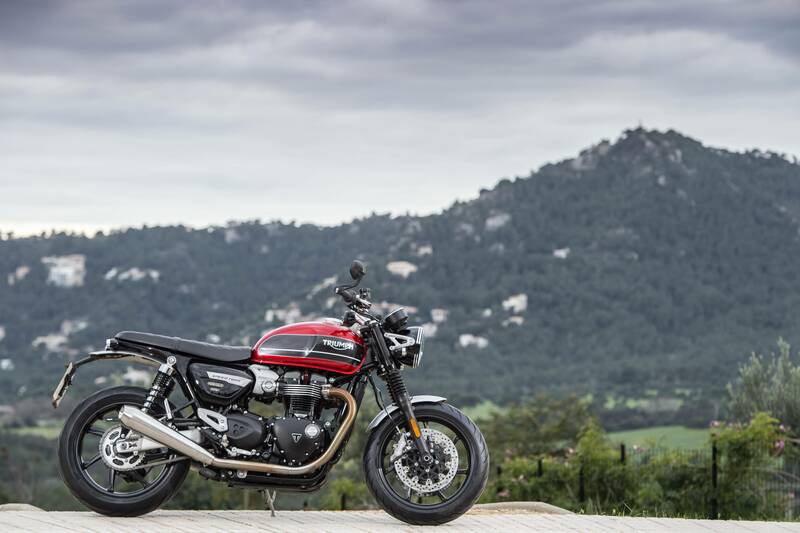 Overall, it’s a job well done, and we think Triumph mostly achieved everything they set out to – it’s a better, more sporty, more powerful and focussed version of the Street Twin, and it’s appropriately priced. A shame about the fuelling – which is a real anomaly for a modern Triumph – but it’s worth it once you’re on your favourite road with no other traffic around. We can’t wait for an R version.